The germ of the idea for Domaine du Pélican, the Jura offshoot of Burgundy’s renowned Domaine Marquis d’Angerville, was a bottle of Stéphane Tissot’s 2005 Arbois Chardonnay “Les Bruyères” that Guillaume d’Angerville tasted blind at a Paris restaurant in 2007. D’Angerville had asked the sommelier to bring him a bottle of something not from Burgundy. On tasting the wine, he declared the sommelier had not followed his instructions and was dumbstruck when the bottle was unveiled. So impressed by the wine was he that d’Angerville began searching for vineyards in the Jura. In 2012, he leased the Chateau de Chavanes in Montigny-les-Arsures, gaining access to five hectares of biodynamically farmed vines. The estate’s holdings were later expanded by two acquisitions of organically farmed vines: five hectares from Jean-Marc Brignot and, in 2014, four hectares from the retiring Jacques Puffeney. The estate, whose name and label are inspired by the Arbois coat of arms, currently makes and sells four wines, all vinified à la bourguignonne, in the Burgundian style, by which d’Angerville means non-oxidized. The estate’s first oxidized wine, a vin jaune, is slated for release in 2022. 100% organically farmed Savagnin primarily from two parcels (Barbi and Grand Curoulet) of Jurassic marl and terre de gryphées. Manually harvested. Lightly crushed then whole-cluster pressed. Fermented in stainless steel and matured 10 months, mostly in neutral 350-litre barrels. which are regularly topped-up (ouillé) to prevent oxidation. 12.5% ABV. Quebec agent: Séguin et Robillard. 100% organically farmed Chardonnay from the Barbi vineyard and three other parcels. Mainly limestone with clay and marl. Wine-making is as for the Savagnin. 12.5% ABV. Quebec agent: Séguin et Robillard. The first vintage of the wine. 100% Poulsard entirely from the Puffeney vineyards. The wine-making was guided by Puffeney. Manually harvested. Fully destemmed. Fermeneted in vats. Matured 10 months in 228-litre oak barrels. 12.5% ABV. Quebec agent: Séguin et Robillard. A PPT, i.e. a blend of Pinot Noir (65%), Poulsard (30%) and Trousseau (5%). Wine-making is as for the Poulsard, though without Puffeney’s input. 12.5% ABV. Quebec agent: Séguin et Robillard. 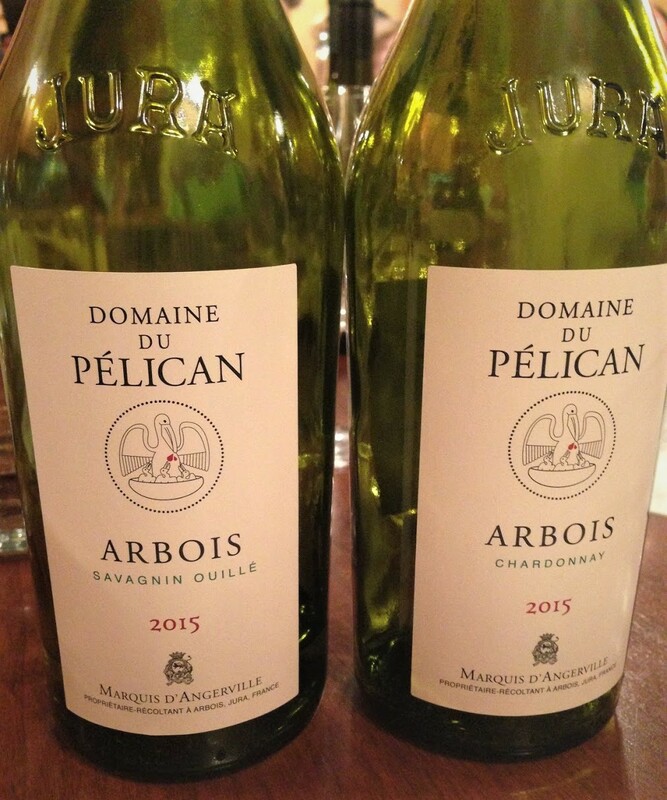 This was my first encounter with Domaine du Pélican’s wines. Going in, I’d wondered whether they would taste more Burgundian than Juraassien. They didn’t. While you’ll have to look elsewhere for the rusticity and funk found and prized in some Jura wines, there’s no denying that these could come from nowhere but the Jura and that the Savagnin and Poulsard are textbook examples of the grapes and style. Why the buy-again buts then? The price. Nearly everyone around the table said they’d plunk for one or more of the wines if they were in the $30 to $40 range but not at $50. My memories of the Savagnin and Poulsard are so vivid and compelling that I’ve come close to splurging on a bottle of each. 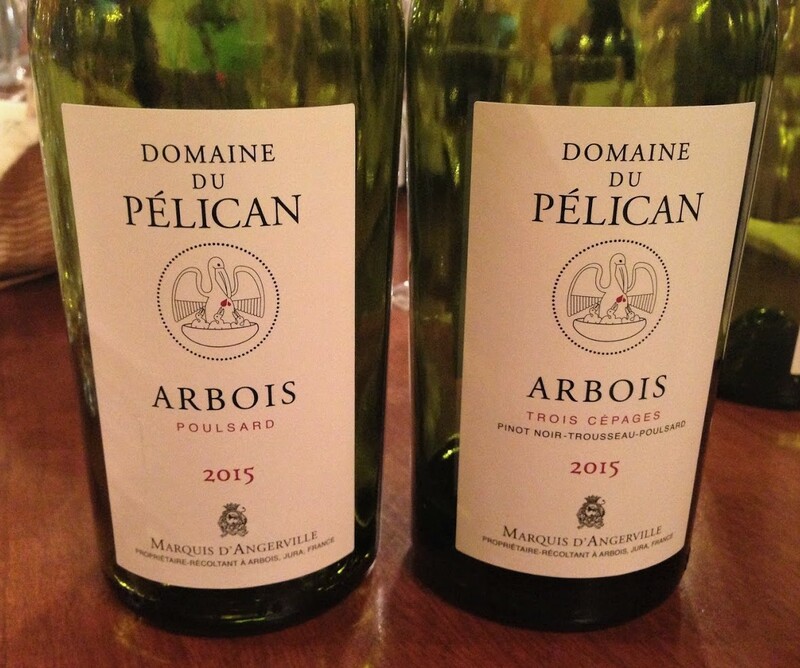 And then I remember that the 2013 Puffeney Poulsard cost $31.50 a bottle (and that was through the higher-markup private import channel), making it hard not to conclude that Domaine du Pélican is charging Burgundy prices for Jura wines, that you are, to some degree, paying through the nose for a name. Maybe that’s why, however outstanding they may be, all the wines in this limited release remain available more than two months after the release date.